Former President George H.W. 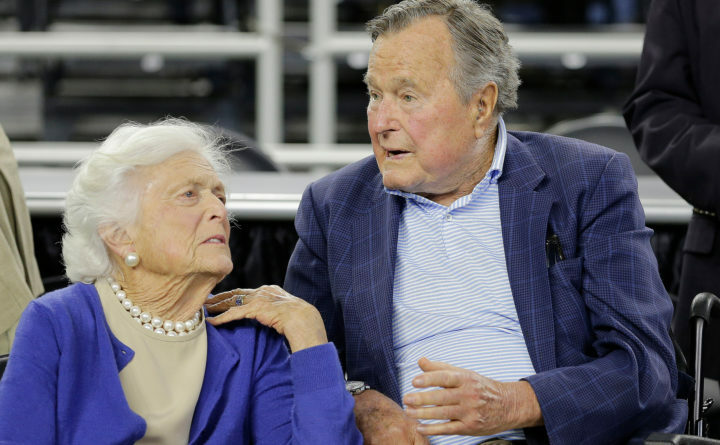 Bush and his wife, Barbara Bush, left, speak before a college basketball regional final game between Gonzaga and Duke, in the NCAA basketball tournament in Houston, March 29, 2015. A family spokesman said Sunday that the former first lady Barbara Bush is in "failing health" and won't seek additional medical treatment. HOUSTON — Former first lady Barbara Bush, who was reported in “failing health” over the weekend, is in “great spirits” and the family is grateful for “everybody’s prayers and thoughts,” her granddaughter said Monday. Eight years after she and her husband left the White House, Barbara Bush stood with her husband as their son George was sworn in as the 43rd president.